Raspberry growers concerned about labour availability could be using commercial robot harvesters on farm in five to ten years. At AHDB’s recent SmartHort conference, Dr Michael Stoelen from the University of Plymouth, discussed his team’s work on soft robotics. 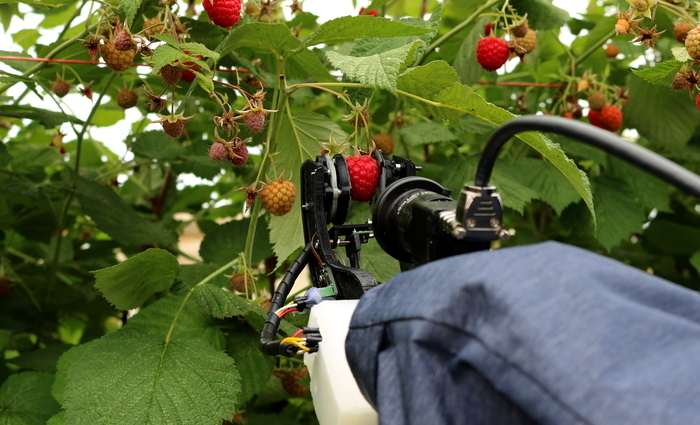 They have built a prototype robotic arm which can pick a raspberry without damaging it in 12 seconds, however they believe once the robot is commercialised they can half the time it takes. Dr Stoelen said: “These initial robots will not replace manual labour. What we expect is that they will be able to pick the more accessible fruit with human pickers there to pick the fruit which the machine isn’t yet able too. Dr Stoelen’s team has focused on human biology as the inspiration for their robots, developing an arm which mimics a human’s ability to shift between being robust and delicate when needs be. The Smarthort conference is part of AHDB’s SmartHort campaign which is designed to help improve labour efficiencies in horticulture through robotics and automation, as well as labour management techniques. All the talks from the SmartHort 2019 conference can be viewed again on ahdb.org.uk/smarthort.